Arts and culture are valued community assets that stimulate economic growth and build quality of life. The businesses and individuals producing and distributing cultural, artistic and design goods and services are known as the creative economy. These creative professionals and enterprises transform original ideas into practical and often beautiful goods, or inspire us with artistry. Nonprofit and for profit businesses produce original creative content that positively impacts North Carolina’s economy. Understanding the creative economy – what it is, how it is measured, and how it impacts the community development conversation – allows the N.C. Arts Council to make connections between arts and culture and economic development. The growth of the creative sector — both nonprofit and private sector creative businesses — has contributed to the strength and resilience of North Carolina’s economy. Communities with a strong arts presence draw people who want to live, work or visit there. Nonprofit arts and culture alone are a $1.24 billion industry. The state’s nonprofit arts and culture sector transforms lives, builds stronger communities and strengthens North Carolina’s economy, supporting nearly 44,000 full time-equivalent jobs and returning $119 million to local and state government. 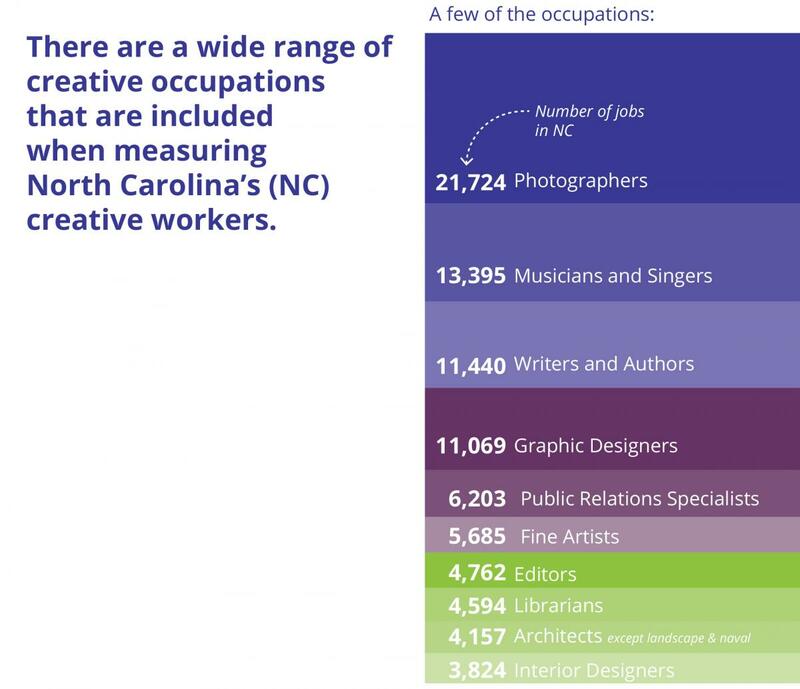 North Carolina has 177,632 total direct jobs within its creative industries (nonprofit and private business), more than 3-percent of the state’s workforce. North Carolina’s creative industries account for 340,360 direct and indirect jobs, more than 6-percent of the state’s workforce. Jobs in creative occupations increased 14 percent from 2006 to 2014. 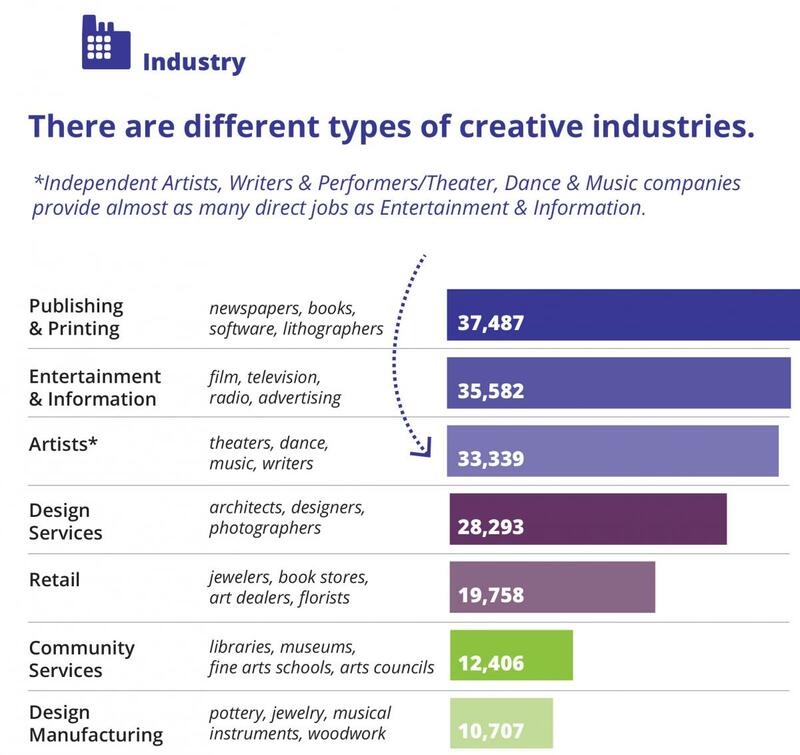 Artists, local arts councils, and nonprofit arts groups attract and retain creative workers. The arts help communities prosper as part of a well-diversified 21st-century economy: the arts provide jobs, attract visitors, create innovative products and shape community vitality. The N.C. Arts Council works to ensure that citizens can fully utilize the arts to build vibrant communities for future generations. Communities across North Carolina are developing innovative arts education programs, revitalizing downtowns, building performing art centers, and producing cultural tourism products that strengthen the local economy and prepare students for jobs. The Arts Council’s SmART Initiative links arts initiatives with private investment, using the arts to transform downtowns and fuel sustainable economic development in six demonstration projects. By documenting the size and the role of the creative economy statewide, we encourage public and private sector leaders to work together in support of arts-driven economic development. Learn about other research projects and facts about the arts in North Carolina compiled by the N.C. Arts Council.